The Rev. Brett Pinder, right, speaks with the Rev. Emily Miller, left, during the Boundaries and Self Care training at Arnolia UMC in Baltimore. Photo by Melissa Lauber. As part of their job description, clergy are called to cross boundaries. Clergy are invited into some of the most intimate moments of people’s lives. They visit in people’s homes, hospital rooms and funeral parlors. The may offer counsel in times of crisis. They speak out on issues that sometimes make people uncomfortable, bringing biblical truth to life. But what happens when clergy go too far, when crossing a boundary becomes a boundary violation? Becky Posey Williams knows they answer to that question, which she shared as part of a mandatory training for BWC clergy and lay leaders in three locations in late January. Williams is on staff at the Commission on the Status and Role of Women, one of 13 general agencies of The United Methodist Church, and she’s an expert on dealing with clergy self-care and what happens when boundaries get violated. Becky Posey Williams offers training at Arnolia UMC in Baltimore. Photo by Melissa Lauber. Posey Williams is convinced that when clergy are bad at setting and keeping boundaries, it’s a set-up for bad things. 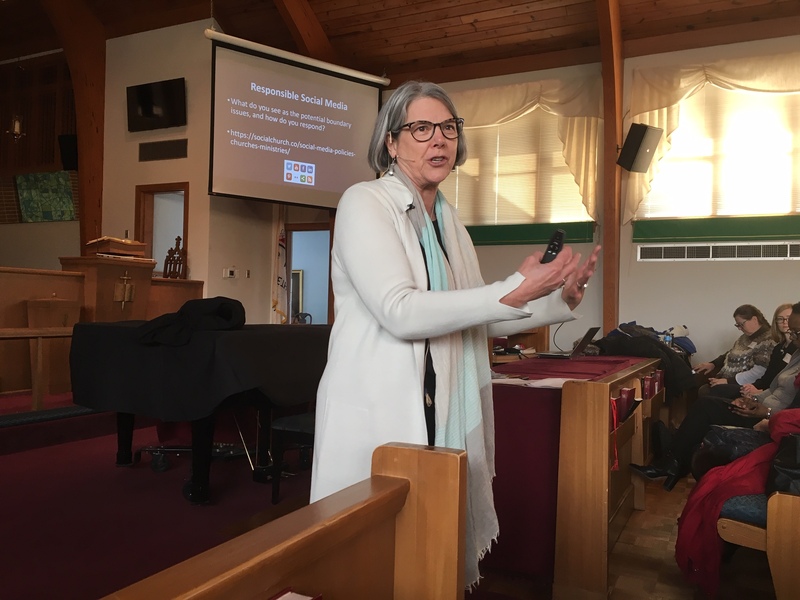 Speaking in Frederick Jan. 29, Baltimore Jan. 30, and Upper Marlboro Jan. 31, Posey Williams asked many serious questions about clergy self-care that generated no small amount of discussion. Posey Williams hit home when she asked about the rationale, if any, for turning a boundary crossing into a boundary violation. Posey Williams noted several times that her six-hour training was just enough time to scratch the surface of these important conversations. The trainings are mandatory for clergy and laity in ministerial roles, she said, because of the General Conference’s actions in the 1990’s. Posey Williams said that it is unknown exactly how prevalent clergy sexual misconduct is in The United Methodist Church; each annual conference keeps records, she said, but those are not shared to a central “clearing house.” An oft-cited 2010 doctoral paper by Sally Badgley Dolch, Healing the Breach, found that on average that between 140 and 500 known cases of clergy sexual misconduct occur annually in the US alone. 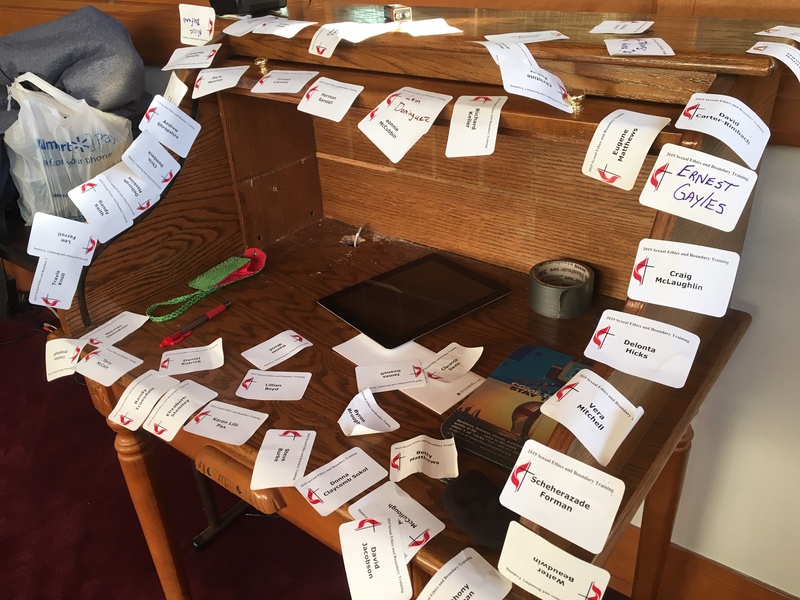 A large part of clergy self-care is having a spiritual director, Posey Williams said. She asked for a show of hands at the Baltimore event of who had one, and barely 10 went up among a group of about 200 people. That power, for example, means that a pastor who is single should never date a person from his/her congregation; that relationship would be imbalanced. “The primary responsibility (of a pastor) is to be the spiritual leader of your flock,” she said. Does that mean clergy can’t make friends in their own congregations? Posey Williams said the best ways to be healthy in ministry are to “get a life” (“What is your life like outside of ministry?”); “know thyself;” have a spiritual director, and find colleagues for study and support. Using the biblical example of David, and his fall from grace as the boy who slayed Goliath and the beloved king, to the man who lusted after Bathsheba and had her husband murdered, Posey Williams noted that staying connected with others who not only talk the talk spiritually, but who “walk the walk,” is important. And echoing Marie Kondo’s method of de-cluttering, Posey Williams said there was one question to bring to everything and every behavior: “Does this nurture me, or does this deplete me?” Practicing awareness of the answer to this question, she said, every moment, is a good place to start.